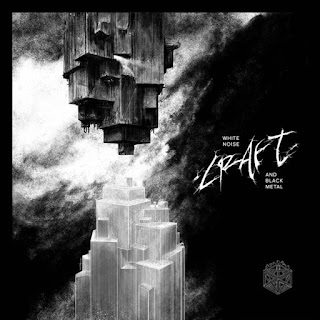 The Sludgelord: REVIEW: Craft, "White Noise and Black Metal"
With their frenetic guitar work, inspired bits of avant garde songwriting, and bleak lyrics, Craft are dead set on reminding us that the vast majority of existence is a lifeless, black wasteland. Summertime black metal is a weird proposition for me. It’s warm, it’s sunny, everyone is hitting the beach, and, here in the northeastern US, it’s been repugnantly humid. It feels much more like deathy, sludgy, occasionally grind weather to me. That deep, swampy rot that makes you want to pass out in the shade somewhere, until the temperature starts to drop at night and the prospect of frost in the morning is suddenly in the air again. The real beginning of black metal season, in other words. But occasionally you get something that blasts a frozen gust through the humid misery, showing a glimpse of that endless, cold waste at the heart of black metal. From what I’ve heard, Immortal’s newest record manages to return the listeners to Blashyrkh, even in the hundred degree days of July. Less heralded but no less impressive is the latest from Sweden’s Craft, who have been quietly amassing a small but incredible discography in the last twenty years. It’s been seven years since Craft laid out a full length, and metal empires have risen and fallen. It’s appropriate that with opener “The Cosmic Sphere Falls” coalesces around timeless themes: depression, dread, apocalypse, death and destruction. “It is eternal. It is beyond.” The winding, interweaving guitar lines, slightly askew time signatures, and whispered/screamed lyrics are hypnotic and terrifying – almost avant garde but simultaneously catchy. The bass is palpable and there’s nearly no midrange – in my ears a perfect black metal balance. And while the drumming is amazing, it’s not overly busy. Lyrically, “Again” is far more harrowing than the icy cold opener. A description of self-harm descending into self-annihilation, it’s juxtaposed against an undeniably hooky guitar line and rhythmic stomp. The dual guitar leads of Joakim Karlsson and John Doe, skewing off into discordant tremolo bursts, are sickening, while the double-time bursts are oddly affirming against such miserable themes. “Undone” solidifies the tension at the core of “White Noise and Black Metal”: personal turmoil and universal chaos. “Undone” pulls back from the suicidal precipice of “Again”, focusing the speaker’s rage toward a cosmos in need of annihilation. The tone is appropriately symphonic – spiritually, that is. This doesn’t go full Dimmu Borgir or anything. “Tragedy of Pointless Games” trades the epic for the individually misanthropic once again. It’s a somber dirge that sounds like the best of mid-period Celtic Frost – I even expected some OUGH!s to burst through the gloom. Instead, singer Nox opines “Awakened and cast into fleshbound pain / Into a tragedy of pointless games,” with such conviction that I felt utterly frozen in the midsummer heat. When it feels nearly unbearably grim, “White Noise and Black Metal” shifts toward a black ‘n’ roll banger, “Darkness Falls”. Somewhat evocative of latter day Satyricon (natch), the first track of side two is a bit of an amalgam of the themes so far, with some creepy otherworldly descriptions sneaking into a grim reality. But before things can get too fantastical, the true horror emerges at the end: “There's a shadow hanging under a tree / And a rope is a tool to set one free.” Instrumental track “Crimson” is an interesting dirge, highlighting the musical prowess of Karlsson and Doe, and allowing bassist Phil Cirone’s skillful and restrained work to shine, but it still feels a lot like any other instrumental interlude. Thankfully the last two tracks may be the best on the record. “YHVH’s Shadow” is a blasphemous screed that is, once again, catchy as hell, especially in a four on the floor headbanger midsection that may be the most fun on a depressing record I’ve had this year. The sinewy, sinister lead guitar line was stuck in my head for days after my initial spin of the record, and is some simple, inspired songwriting. The final track, “White Noise”, is a final kissoff to existence itself – individual or universal, where the human experience is something to be endured, a “distasteful, tiresome thing.” I should note here that Nox’s delivery is uniformly excellent on the record, but on this track it may be the most intelligible, adding extra heft to the fury. There’s a dynamic balance between the chugging rhythm guitar and the high end lead work, and a final crescendo that’s so intense it feels like the world itself may be falling to pieces. Against all expectations, I found myself truly immersed in a black metal record despite the season, despite the warmth, the sun, the muggy misery. I was reminded that the heat death of the universe is inevitable, that the nature of things is stasis, that death is so, so much longer than the brief bits of living. “White Noise and Black Metal” is more than a glimpse of winter – it’s a blast of cosmic cold. With their frenetic guitar work, inspired bits of avant garde songwriting, and bleak lyrics, Craft are dead set on reminding us that the vast majority of existence is a lifeless, black wasteland. That’s far more chilling than even the darkest Norse myths or winter nights.